Doing Business in Nigeria: How Foreign Companies and Offshore Investors Can Establish in Nigeria - Law Firm in Nigeria - Lawyers in Nigeria. The Nigerian government welcomes foreign direct investment and foreign portfolio investment. Lex Artifex LLP, a law firm in Nigeria, has launched the Doing Business (DB) Helpdesk to assist investors looking to set up in Nigeria. This publication gives a snapshot of the legal and regulatory considerations for doing business in Nigeria. Foreign investors or offshore companies can hold 100% equity stake in a Nigerian company. However, a foreign company wishing to set up business operations or doing business in Nigeria should take all steps necessary to obtain incorporation of the Nigerian subsidiary as a separate entity in Nigeria for that purpose. Until so incorporated, the foreign company may not carry on business in Nigeria or exercise any of the powers of a registered company. Through a Power of Attorney, Lex Artifex LLP can assist a foreign company in the formation and incorporation of a Nigerian subsidiary. Overseas investors and foreign companies looking to locate in Nigeria must obtain Business Permit or Expatriate Quota from the Nigerian Immigration Service. Expatriates do not require work permits, but they remain subject to needs quota of their employer company requiring them to obtain residence permits that would allow income remittances abroad. Business permit is the authorization for the operation of a business with foreign capital either as a parent company or a subsidiary of a foreign company. The expatriate quota is the authorization to a company to employ individual expatriates to specifically approved job designations, and also specifying the permissible duration of such employment. The expatriate quota forms the basis of work permits for expatriate individuals (those qualifications must fulfill the criteria established for the particular quota position). When deciding on doing business in Nigeria, you will need to choose between establishing a new company or acquiring an existing company. If establishing a new business, a variety of business structures are available. The four main types are sole proprietorship; partnerships; incorporated trustees; and companies. You need to decide on the company structure that will best suit your business needs. The business structure will determine the cost, tax, legal, regulatory and financial risk implications. Your situation may require advice from a Solicitor. Any of the above companies may be a Private Company or a Public Company. Advantages of Company Limited by Shares Over A Business Name? A company is its own legal entity. Its identity is separate from the shareholders, directors, and employees. It has perpetual succession – meaning that the business can continue despite the resignation, bankruptcy or death of directors or shareholders. The shareholders and directors have the protection of limited liability tied to their personal guarantees and/or the value of shares they hold in the company. It is relatively easy to expand or to scale-up by selling shares or offering a stake in the business to outside investors. The company can sue or be sued in its own name. A company has more credibility. It is easier to raise large sums of money for the business or sell a part of the business. It can take advantage of the investment incentives, pioneer status and tax exemption offered by the government. You can only use a name that is not identical to an existing registered organization in Nigeria. A name availability search must be conducted at the Corporate Affairs Commission (CAC) registry to see if the name is available for use. Where it is available, same will be approved for registration. Name availability check and reservation can be effected within 24 hours. Entities doing business in Nigeria must be registered with the Corporate Affairs Commission either as a Business Name or as a Company. Foreign investors interested in entering the Nigerian market may wish to establish a new Nigerian company or establish a new Nigerian subsidiary which also operates as a distinct legal entity from the offshore parent company. Companies must have a Memorandum of Association and Articles of Association (MEMART), a Solicitor can assist you draft a MEMART to suit your business objects and file a copy of same at the Corporate Affairs Commission registry; make payment of stamp duties on the incorporation deeds and conclude registration of the company as a legal entity. Company’s MEMART or Business Name’s Partnership Deed will deal with ownership and management issues and contain the rules governing how the business is run. The deed will pin down the key issues and set out any restrictions on what the business can do and how decisions will be made. All categories of company shares (i.e. whether ordinary or preferential) issued by a company doing business in Nigeria must carry one vote in respect of each share. Shares with the weighted voting right are prohibited. A company must have at least 2 directors (non-employee shareholders). However, private companies must not have more than 50 non-employee shareholders. The directors are the shadow of a company and at the heart of its corporate governance A company doing business in Nigeria can have either foreign or Nigerian directors, and the directors may be resident or non-resident. If you are looking to acquire or lease a business or office location, a Solicitor can assist you with available options. The acquisition and development of land in Nigeria are perfected at the state or local government office where the land is situated. Approvals, assessments (including environmental and structural assessment) and other regulatory requirements may differ between state jurisdictions. The Federal Inland Revenue Service (FIRS) and State Board of Internal Revenue are responsible for the collection of corporate and personal taxes, respectively. Every company, business name or incorporated trustee must be registered with the FIRS and obtain Tax Identification Number (TIN) and Value Added Tax (VAT) Number, make and deliver to CAC the Annual Return in prescribed forms within the stipulated time. Filling of financial returns must be done within 18 months of incorporation/registration and must be completed and filed within 42 days after the organization’s Annual General Meeting. A financial year can in principle start on any given date. There is criminal liability for tax default and evasion. You may request the services of a Solicitor or accountant for information on taxation as per doing business in Nigeria. Your business may have proprietary rights to certain intellectual assets. To ward off infringements, you will require the services of a Solicitor to register or protect these rights as patents, trade secrets, copyrights or trademarks. 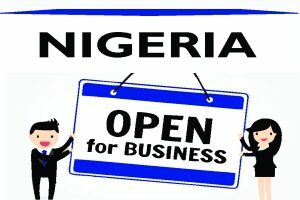 Certain businesses are subject to monitoring, regulatory control and licensing by relevant government agencies such as National Agency for Food and Drug Administration and Control (NAFDAC), Nigerian Investments Promotions Commission (NIPC), Nigerian Exports Promotion Council (NEPC), National Office for Technology Acquisition and Promotion (NOTAP), Nigerian Copyright Commission (NCC), Nigerian Customs Service, Central Bank of Nigeria (CBN), etc. You want to obtain the necessary license and comply with health and safety, environmental and other regulatory obligations to avoid punitive liability. Request the services of a Solicitor to prepare the employment contracts and work manual for your staff (or addendums for your employees outside Nigeria) and comply with the requirements under the Labour Act to avoid future legal liabilities. You must submit annual accounts and tax returns to the Federal Inland Revenue Service (FIRS). You must also file a statement of affairs or an annual return with the Corporate Affairs Commission (CAC). You risk a fine if you miss deadlines or submit incorrect information. There are a number of other statutory requirements. For example, there are obligations you must fulfill under the Companies and Allied Matters Act, Labour Act, Insurance Act, Pension Reform Act etc. An accredited Solicitor can advise you and help you perfect these administrative obligations. An alternative to establishing a new or subsidiary company may be to acquire an existing Nigerian company. Merger and Acquisition processes in Nigeria are regulated by the Securities and Exchange Commission (SEC). Investors interested in acquiring a Nigerian company may have to make a formal bid. A bid to acquire a Nigerian Company is subject to approval by SEC and sanctioning by the Federal High Court. Nigeria has a stock market, allowing access to long-term capital. To obtain and maintain an NSE listing, your company will need to meet the prescribed requirements set out in the stock exchange listing rules. This includes company disclosure and reporting requirements. Foreign investors are treated the same as local investors under Nigeria’s laws. This guide is intended to assist you in getting the summary of the regulatory considerations for company formation in Nigeria. This guide does not eliminate the need for professional advice and must not be construed as a substitute for legal guidance. The omission of any matter in this guide will not relieve you from any penalty incurred by failing to comply with the statutory obligations of relevant laws. Whether you are just starting up, expanding your activities, or looking to doing buisness in Nigeria, it is strongly recommended that you use professional advisors to help you with the legal, tax and regulatory complexities. Lex Artifex, LLP. can get you started and assist you through every step of the investment process with all your business’ legal needs. Our team is ready to help. Feel free to reach us at +234.803.979.5959,email – lexartifexllp@lexartifexllp.com. Your complete company kit will include – the Incorporation Documents, Common Seal and Stamp bearing your company name. Cost of producing the company kit is part of our professional fees. Courier service from Nigeria to your designated address is charged separately. Nigerian receptionist service is conducted in English, within normal office hours of Nigeria. The receptionists greet the callers with your company names and inform you the callers’ contact information by email for your reply. Correspondence address is a commercial address; thus, it is not able to collect and store bulky items. To reach us, call at +234.803.979.5959, email: lexartifexllp@lexartifexllp.com.